The 50/50 show will feature 50 works of art done by 50 artists with each piece selling for $50.00. 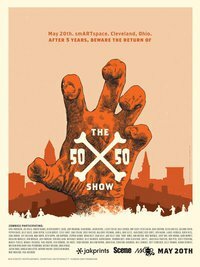 The 50/50 show was one of Northeast Ohio’s most anticipated art events and was one of 1300 Gallery’s most popular shows. This show will bring to the art patron a chance to own an original work by some of the best local talent at a very affordable price. Each work will be hung for one night only, with sales being completed that evening. This entry was posted in cleveland, galleries, ohio, shows and tagged art news, cleveland, exhibit, exhibition, gallery, live, music, show, theater. Bookmark the permalink.